For as long as she can remember, Gwendolyn Allister has never had a place to call home - all because her mother believes that monsters are hunting them. Now these delusions have brought them to London, far from the life Gwen had finally started to build for herself. The only saving grace is her best friend, Olivia, who's coming with them for the summer. The world Gwen finds herself is called Neverland, yet it's nothing like the stories. Here, good and evil lose their meaning and memories slip like water through her fingers. As Gwen struggles to remember where she came from and find a way home, she must choose between trusting the charming fairy-tale hero who says all the right things and the roguish young pirate who promises to keep her safe. With time running out and her enemies closing in, Gwen is forced to face the truths she's been hiding from all along. But will she be able to save Neverland without losing herself? You had me at Neverland. And you sold me with a Peter Pan that is a terrible, horrible, no-good, very bad guy. Ever since my binge viewing of the web series "The New Adventures of Peter & Wendy," I've been a little obsessed with the magical world of faeries, and mermaids, and pirates. I never particularly liked the story as a child, but for some reason it resonates with me now. It even found its way into my NaNo in 2015. But Lisa Maxwell just kills it. Kind of literally, and also just because she rocks! 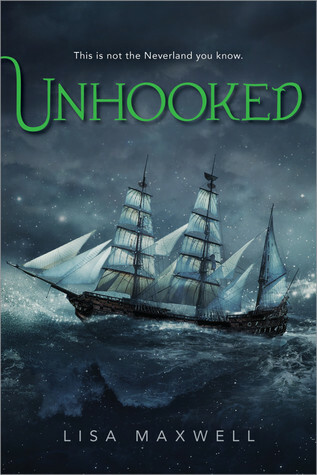 Not quite sure why it's called Unhooked and not a huge fan of the cover, but it is a MUST read if you're fan of retellings. Gwen's mother is crazy. So crazy in fact that they're constantly on the move, running from the monsters that her mother claims are always on their heels. Carted off to London, best friend in tow for a visit, Gwen and Olivia are quickly kidnapped by shadowy creatures and taken to an unbelievable land where nothing is quite as it seems. Gwen is rescued from the cruel seas by The Captain, sailing his ship around the waters of Neverland, trying to keep his young crew alive, but when the boy named Peter Pan tempts her away, believing her to be far more than the normal girl she craves to be, Gwen realizes that sometimes trusting yourself is the hardest obstacle of all. As a vision, a story, a retelling, this was absolutely amazing. Maxwell turns the story on its head in so many ways, expounding on the overly confident elements of Pan's personality and adding an emotionally damaged, yet fierce, Captain who is willing to go the distance to save those he cares about. It's still a story about power, and imagination, and fighting the inevitability of growing up, but it's also a story of loss, and fear, and the trappings of that power. And there are really mean faeries, and terrifying mermaids, and the Captain is dreamy. Totally dreamy. I'll be recommending this A LOT in my library. So you should probably go ahead a read it before I shove it into your arms!